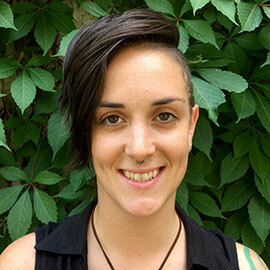 For Laurier’s Sexual Violence Support Advocate Sarah Scanlon, offering support to survivors of sexual violence goes beyond providing resources – it means developing a personal connection and creating a safe place where survivors feel heard, believed and validated while they work together to explore options that best meet the survivor’s needs. The university established the sexual violence support advocate role to provide survivors and others impacted by sexual violence with a direct and accessible avenue to support and care by someone trained to actively listen, guide them through the options available on and off campus and advocate for their needs. The sexual violence support advocate is a key part of Laurier’s broad-based and multi-faceted efforts, which are supported by the staff, faculty and students who form Laurier’s Gendered Violence Task Force (GVTF). Through inclusive dialogue; training and research initiatives; accessible policies, protocols and support services; community engagement and campus collaborations, the GVTF is working toward eliminating gendered violence at Laurier — and to support the healing of those who have experienced it. Scanlon, who has more than 12 years of experience providing sexual violence support, emphasizes Laurier’s focus on creating and promoting a culture of caring and sexual ethics. Laurier is committed to fostering a university culture that does not accept or tolerate acts of gendered or sexual violence, and one which holds individuals or groups who commit these acts accountable. Having the sexual violence support advocate as a source of support for the campus community is an important element of this process. Referrals to counselling and medical services and trauma-informed care resources. Understanding the on- and off-campus reporting and complaint options available (including understanding official complaint procedures and limits to confidentiality). Navigating systems and resources within the university and the broader community. Supporting communications between the survivor and the university. Advocacy within university and legal systems. In addition to serving as a resource for survivors, Scanlon can provide support and resources to those who are helping someone who has disclosed an experience of gendered or sexual violence to them, family and friends of survivors, and people who have caused harm. Scanlon’s role is multi-campus. In Waterloo, Scanlon can provide support services in person at the Diversity and Equity Office, room 117, MacHouse Residence; via email at sscanlon@wlu.ca; or by phone at 519.884.0710 x4847. Scanlon is available one day a week in Brantford at the Diversity and Equity Office, 95 Darling Street, St. Andrew’s Community Centre, Office 300 (second floor). On both campuses, additional support is available through partnerships with the local sexual violence support centres. In Brantford, through a partnership with the Sexual Assault Centre of Brant, students can also receive support from the sexual violence counsellor and advocate, Hayley Moody at hayley@sacbrant.ca or 519.751.1164 x209. In Waterloo, the Sexual Assault Support Centre (SASC) provides on-campus counselling two days a week. To book an appointment with a SASC counsellor on-campus call 519.571.0121 or email intake@sascwr.org. Laurier has long-standing relationships with the Sexual Assault Support Centre of Waterloo Region (SASC) and the Sexual Assault Centre of Brant, which both offer after-hours support. Sexual Assault Support Centre of Waterloo Region 24-hour support line: 519.741.8633. Phone support is available in over 200 languages through an interpreter service. Sexual Assault Centre of Brant 24-hour crisis and support line: 519.751.3471.